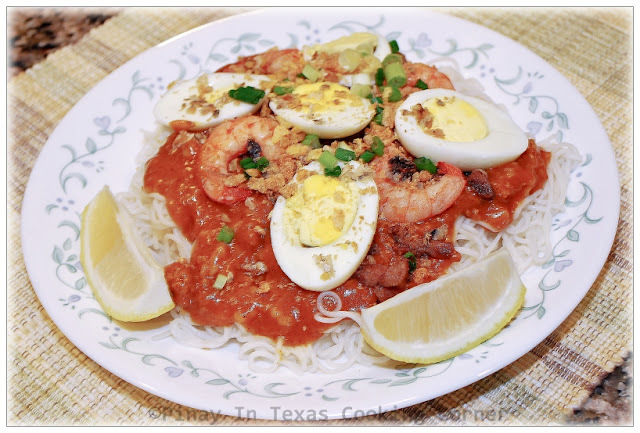 For my first recipe here on Pinay In Texas Cooking Corner, I want to share with you one of my husband's favorite, i.e., Pancit Palabok. Pancit or pansit is the term for noodles in Filipino cuisine. Noodles were introduced into the Philippines by the Chinese and have since been adopted into our local cuisine. According to Wikipedia, the term pancit is derived from the Hokkien pian i sit (Chinese: 便ê食; Pe̍h-ōe-jī: piān-ê-si̍t) which means "something conveniently cooked fast." 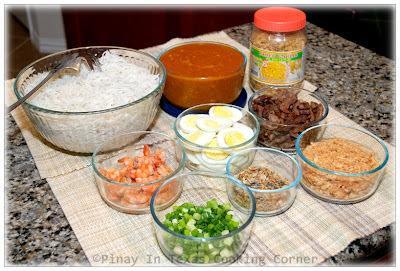 There are a lot of pancit variations in the Philippines and pancit palabok is one of them. 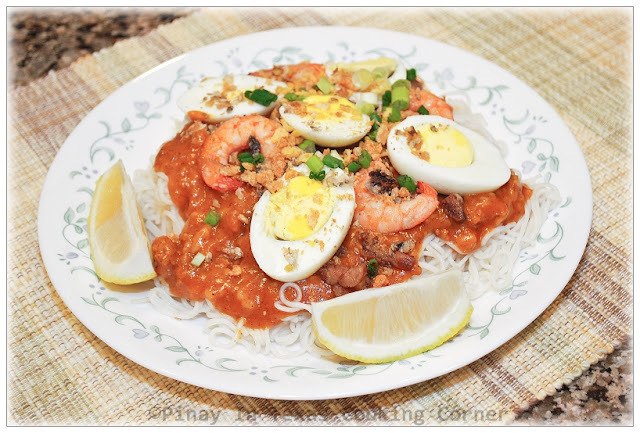 The name "Palabok" which means "garnishing" in Filipino refers to the topping ingredients such as cooked shrimp, boiled pork, crushed chicharon, tinapa flakes, green onions and fried garlic that are used in this noodle dish. But the garnishings in Pancit Palabok are more than just decorations, they're what make this dish incredibly delicious. I remember how much my husband & I love to go to Goldilock's España across UST just so we could eat Pancit Palabok. During our college days, that was the most delicious pancit palabok we could afford with our tight student budget. When we got married, it's one of the first dishes that I tried to learn to cook, and has been a favorite weekend meal for us. If you love Goldilock's pancit palabok, I guess you'll love this even more. Check it out and see for yourself! 1. Soak noodles in cold water for 20 minutes or until they soften a bit. Cook in a pot of boiling water until tender but still firm. Drain well and set aside. 2. In a saucepan over medium heat, sauté garlic in olive oil until light brown. Add ground pork and cook for about 10 minutes. 3. Mix the annatto powder in pork broth (or if you are using annatto seeds, discard the seeds and add the annatto water to pork broth) then pour the mixture into the saucepan. Bring to a boil. Add the shrimp juice. Stir and simmer for about 3 minutes. Add dissolved cornstarch and fish sauce. Season with salt and pepper to suit your taste. Simmer until sauce thickens. Set aside. 4. Place the noodles on a serving plate. Pour sauce on top of the noodles then arrange the toppings over the sauce. Serve with a slice of lemon for added flavor! Oh yeah, what's annatto btw? How does it taste like and can I substitute with any others? Your recipe looks good. I will try to make this on Christmas. Where are you located in Texas? I'm in Dallas. Nice to have you on PiTCC, JJ! We're close, i live i Carrollton area. maybe we could share our recipes.